Today we’re posting an article from GoldChartsRUs. Gold, silver and gold shares jumped up to a two week high while crude hit a 6 week high. The ongoing U.S. dollar dive has finally given them a boost. And it now looks like the dreary days of June are behind us. Our Chart of the Week shows this clearly. Note how the dollar index and the gold price normally move in opposite directions. But there are times when one leads the other or they even move together for awhile, but they always eventually go back to their normal state that is to move in opposite directions. Most interesting is their relationship this year. Note how gold resisted twice near the $1300 area (see green asterisks) while the dollar continued its tumble. Gold fell back in June in a decline we call ‘B’. 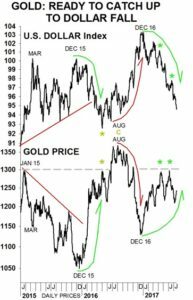 Gold has now regained its posture, bouncing up from its July 7 low, and it happened during the last fall in the dollar. It now looks like gold weakness is over, or just about over. It’s time to keep an eye on $1300. The only time it surpassed $1300 for a while was during the Brexit jump to last year’s August highs. You could say, if it wasn’t for this jump, gold would’ve probably resisted near this level. The dollar indeed bottomed before Brexit and it too jumped up when the British Pound collapsed. This means once gold breaks clearly above $1300 it’ll be breaking out of the stalemate situation this year. It’ll become a ‘C’ rise in the bull market, and it would be very bullish above last August’s high. In other words, it’s time for gold to ‘catch up’ to the weakness in the dollar. Gold shares just don’t want to fall further. 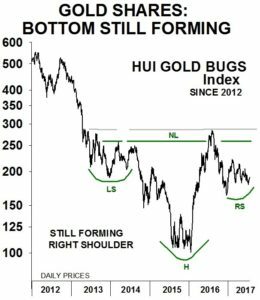 It’s also very interesting to note that this turn of events is coinciding with a four-year head and shoulders bottom in the HUI Gold Bugs index. As you can see this bottom has been evolving since 2013 and it’s still forming. And based on this technical pattern, if the index eventually breaks above the neckline (NL), the bottom will be complete and confirmed and gold shares could soar. So this is something we’re watching. The stock market rise just doesn’t quit. The markets seem oblivious to politics. From Donald Trump Jr.’s emails to Russian involvement in the U.S to an ever growing subprime auto loan problem, the markets don’t care. Perhaps it’s the calm before the storm considering a number of hot spots around the globe. Short-term interest rates have been on the climb while long rates are sluggish. Yet Janet Yellen says the Fed may not have to raise rates more. This gave gold and the stock market a boost upward while keeping pressure on the dollar. The question here is, can the Fed’s Yellen and central bank policy markers really drain trillions of dollars in liquidity without harming the economy? We’ll see. For more information about GoldChartsRUs, click here.